Have you recently experienced a some regrets and setbacks? Or maybe even something in your life you perceived as an absolute failure? I’m going to quick throw this out there - I don’t really believe in failures. At least never in the pure sense of the word. We are always learning from our experiences, so I don’t really believe there’s any such thing as a pure failure. However, regrets and setbacks are unfortunately a part of life we can’t really avoid. So let’s chat about them, because odds are if I’ve had one recently, and we are all human, you’ve probably experienced one recently too! Whether you’re experiencing a regret or a setback with your physical health, mental or emotional health, your spiritual practice, your career, or your family and relationships… there are some key tools we can all employ to help accept these times, and know how to move forward in confidence. Recently I have been reading the Fire Starter Sessions by Danielle LaPorte. It’s an amazing book for anyone who considers themselves an entrepreneur or a go-getter in following their careers and passions and talents. But right away in the beginning of the book Danielle explains a time in her life where she was experiencing one of her biggest setbacks/regrets/presumed failures of her life to date. This single quote stuck out to me as if the words were raising off the page to my heart. I wrote it down on a sticky note and stuck it where I’d see it constantly for the next week. You see, I struggle with feelings of being trapped often. Maybe you do too! Maybe it’s my wildly creative soul, maybe it’s because I’m a dreamer to the fullest dimension, but I constantly finding myself pushing to extend my horizons. And yet, what I find, is that most of my limitations are pure figments of my imagination! I’m like that ant on the sidewalk. Have you ever drawn a circle out of chalk around an ant on the sidewalk? He’ll go crazy. He’ll get to the edge of the chalk and he won’t cross over because he thinks there’s a border there. But there isn’t. (It’s kind of insensitive, I wouldn’t recommend doing it, but it’s a fascinating example of what I’m talking about here!). If you can relate with me, maybe that quote will resonate with you like it did with me. 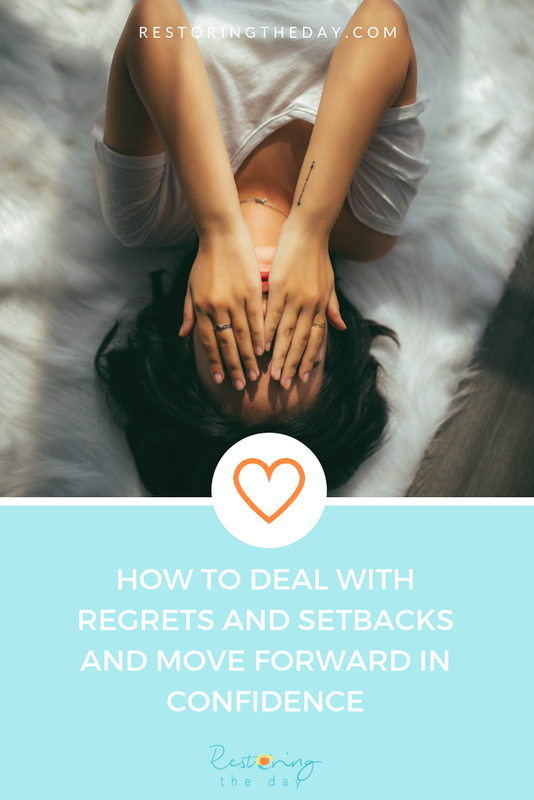 Because I’d venture to say, most of us are afraid to move on from perceived failures, regrets, and setbacks, because we are afraid of making the same mistakes again. Would you agree? I know it’s true in my life. But if you’re ready to MOVE ON but you feel stuck in the past, or unable to move past your fears of failure or thoughts about where you’ve been, let me just remind you that you are FREE. You and I are sometimes a lot like that ant. We just have to realize, we can walk right through those barriers to the other side where growth and expansion can really flourish us. So let’s walk through some steps and ideas. One of the first action steps you can take to overcome your fears and to step outside of regret, setbacks, and failures is to take inventory of your thoughts. When you have a demoralizing or depressing thought about what just transpired or your current situation, take that thought at face value for what it is. Is this thought REALLY true about me? Or am I just perceiving that it is? Well, the first thing I had to do was step out of my thoughts and take inventory of them. My thoughts were trying to protect me, “don’t go back out there! It’s scary!” my thoughts screamed at me. But I had to simply acknowledge that my thoughts were simply not reality, and that many other factors were involved in that setback. I could move on knowing that I was still a good designer, and I could move on to step two… what did I learn? I honestly believe this: that there really are no failures. Life is a beautiful thing, and sometimes it gets really uncomfortable. But even in these moments where we experience perceived failure, epic setbacks, regrets over life, we have the divine privilege to be able to first bust out of the chaos of our thoughts and take inventory on what’s really reality, get our feet firmly planted back on the ground, realize our place in the world, and then start jotting down all the things we learned from that experience! Pretty amazing privilege, right? We truly are free-er than we think we are, and it’s amazing. So let’s take an action step! Consider making a list. What did you learn from this painful experience? Be honest with yourself. As soon as you start writing, you may feel your spirits lifting. I need a better communication system in place with my clients. I need keep all my notes in one place so I don’t lose any of them. Be more careful of that friendship vs client line in the future! Keep it more professional. Yeah. Especially that last one. Did you get that? That would have really helped prevent most of the problems I encountered with that situation. Your list will look different from mine. But make sure you are kind with yourself, generous with yourself, give yourself grace… be honest, but be objective. Remember, we already distinguished which of our thoughts were actual reality and which have been simply trying to sabbatoge us. Here’s a shameless plug! Bring a health coach alongside you in the process if you need to, to help support your emotional, mental, spiritual, and physical health along the process as you grow and stretch into the future and this new version of you! Coaches have saved my life. I have epic respect for each and every coach and mentor I’ve had the honor of sitting with, and grateful for the introspective questions they’ve helped me ask myself. We all experience setbacks. My example here of my perceived “designers fail” was a minor setback in career. It seemed huge to me then, but now I see it for what it is - just a spec on the roadmap of my life. We could talk about setbacks all day long. They’re part of life. But in the end, this is what they will look like, mere specs on the map. You might have been the healthiest version of yourself a few years ago, and then, well… life happened. Because that’s how it goes, right? You may have felt things in your career were humming along as planned, but now you feel absolutely stuck. Setbacks happen all the time in our lives. The key is, knowing how to gather a toolbox of things to help you maintain your emotional, physical, mental, and spiritual stamina throughout life, in spite of these fears, regrets, and setbacks. I am a health coach because being a coach-ee has helped me be able to navigate life with a steadier gaze. I know who I am, I know my place in the world, and I have a tool box that I’ve created for myself so that I know what to do when things in life try to set me back or sink me. I can stay a-float because I have a curated list of tools I can utilize at any time to assess where I’m at and know what to do next. It’s a very powerful thing. The beauty is, we don’t have to stay locked into regret mode, or even fear mode. You’re free. There’s more to you than that. The best of you is still yet to come if you’re ready to grow from this experience. Think about what you, three years from now, will say to you once you’ve walked through this as an epic learning experience and you’re stronger than ever! My guess is it’ll go something like this. At least, that’s how I imagine it. What about you? * this post contains affiliate links. Thanks for supporting Restoring the Day and using any affiliate links within the free content we offer!